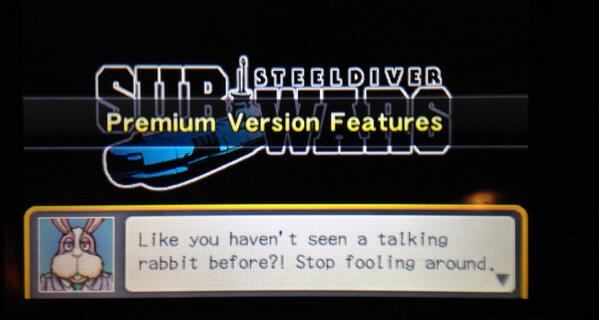 Following yesterday's Nintendo Direct broadcast, Nintendo released Steel Diver: Sub Wars onto the 3DS eShop. This free-to-play title is based on the original Steel Diver, which was an early 3DS game. Both are co-developed by Vitei, the Japanese studio founded by British developer Giles Goddard. Goddard found fame as one of the first western coders to be welcomed into NCL's hallowed halls, but his relationship with the company goes back to when he was employed by UK studio Argonaut, which not only created the Super FX chip that powered Star Fox on the SNES, but also helped with the production of the game itself. This could be an innocent cameo, but it has predictably led some fans to hypothoise that Steel Diver: Sub Wars takes place in the same fictional universe as the Star Fox series. That could be seen as some pretty wild speculation, but how else does one explain the presence of a talking rabbit? Share your own thoughts on this with a comment below. I was thinking this while playing it has a very star fox vibe to it also clever use of nostalgia using Peppy for the full game purchase. I bought the game this morning along with the 5 submarines. I'm pretty satisfied with it. You really feel like inside of a submarine doing some matter to keep yourself from being seen until the last second ! Oh now theyre just teasing us! Haha! General Peppy, how low can you go? From Arwing pilot to submarine salesman.... immediately buys the game DIVE! DIVE! No really, it's an awesome little game. @Ichiban Your avatar makes me smile EVERY TIME I SEE IT. Wish it was set in the Wii u universe!!!!!! Anybody know what exactly is unlocked if anything for online Multi with purchase of premium version? @TwoTheNines Well, you only have access to two subs in free mode. 2 more are directly unlocked through premium, all others are unlocked through your player level. The same goes for crewmembers i believe. @Topic I dont think that it is set in the same universe. The lylat system is almost entirely inhabitat by anthropomorphic animals. On the other hand, F-Zero is set in the same universe, and thats pretty much set in stone since the vehicles use the same G-Defuser system that was used in the Lylat Wars. Lets just say it is set in the nintendo universe. And each franchise takes part in its own solar system. This way, each franchise exists on its own while stil making crossovers possible. @Einherjar Oh ok so you can use the unlocked subs fully in multi. Good to know thx. What about other stages? I guess Peppy was chosen simply because the purchase guide for Streetpass plaza was a rabbit. Otherwise they could've implemented any StarFox character. @TwoTheNines As far as i know, stages for multiplayer matches are selected randomly. And there seem to be quite a lot of them. For singleplayer, the free version offers you 2 out of 7 missions, each with 3 variants. @Einherjar thanks! I really like the multi and anyone curious should give it a go! You may just find the more methodical fist person approach by nature of the underwater control really appeals to you. Got the game last night and played for a bit but did not see any presence of Star Fox. Would be interesting though! so this means this is a new star fox game then? but can you barrel roll? Haven't played this yet but Peppy looks kinda young in that picture. Wonder if that puts it in the snes star fox universe. If one of the subs was the Blue Marine I'd be so happy. I noticed that...it was quite the wtf moment for me during the Direct. On topic, I really hope is not the same universe. For Star Fox's sake. ...it's. A. Freaking. CAMEO. Does no one else remember the days when cameos were small inclusions added to give the players a smile? People these days take all the small things way too seriously. If there was anything similar, I would say that Sub Wars probably just uses the same engine as Star Fox 64 3D. @Shiryu Salesman? I get the joke Nintendo was aiming for here. The Streetpass Mii plaza has a talking rabbit as a salesperson. That is what Peppy is referring to. @Starwolf_UK Yeah, its pretty clever stuff. <3 Nintendo! I was joking in the Nintendo Direct chat yesterday when I said it looked like the submarine level from Starfox but it turns out I was accurate. I second/third/whatever the call for a Blue Marine. Just, please, even if it's DLC. I suppose it sort of counts as a historical sub. And yes, to anyone who hasn't played the game yet, try it out. The stuff's free, the only thing you got to lose is memory space, and you could just delete it if you don't like it. I highly doubt this is a universe melding thing going on here, just some tongue in cheek cameoing. Peppy makes a fine salesman, though let him be in his own game again soon, Ninty. A fun little game besides the fact that you can't find your friends to do any online with them. If they had implemented that, I'd jump into the full version straight away. As it stands though, I'm going to need to think about it. How much does the premium version cost? (Clunky the way it worked went to the shop and timed out) . That is very possible. The "wars" in the name of the game could be a reference to "lylat wars". Btw... Isn't Peppy a hare and not a rabbit? Ehh it's just a prank. Much like the image well up this roll of comments of the human Fox McCloud bit from F-Zero on GC. Would be cool if it was true, but there definitely needs to be more proof before we can say it's fact. i can explain his appearance; easteregg. Frankly, I don't see the Star Fox resemblance in this game except for the Peppy cameo, and it's just that: a cameo. I doubt there's any universe collision going on here. Seriously Nintendo this Tease was a Bad one, Just make a StarFox Game that everyone is asking for already!! played the free version. If thats meant to get you to buy full version well It didnt do it for me. nah, just a fun little cameo!